A century is a unit of time depending for its exisence upon man's capacity to deal with number 100 and to conceive of periods extending beyond his limited life span. In this sense it is a man-made cycle which, moreover, is given different starting points by different cultures. Still, there is no reason why the relative nature of the measuring unit should lead us to ignore it in astrology. The entire universe we deal with in astrology is also, if not strictly speaking man-made, at least defined by the limitations of our senses and our intellectual capacities — even if these limitations are broadened by our complex instruments. There almost certainly are planets and stars we do not see and which send vibrations not perceptible to our radio telescopes. There may even be parallel universes which somehow interact with ours in ways we cannot comprehend and still less measure. And it is possible, if not probable, that numbers in themselves have a cosmic or cosmogenic power that operates whether or not chunks of matter or waves of energy are involved and allow us, if we perceive them, to measure the cyclic effect of recurrent series of numbers. Yet even if we assume that there is an archetypal formative or cyclic power in the number 1900 and in the period of one hundred of our years, we must realize that centuries are cycles whose beginnings depend on purely sociocultural factors. The astrological significance of a century is therefore also limited to the specific society or religion which established its particular calendar and the start of the era it associates with its essential and spiritual unfoldment. The Christian era differs from the Jewish or the Brahminical eras. Even the officially Christian Western civilization has been divided by the use of either the Gregorian or the Greek Orthodox calendars, so that the twentieth century did not begin on the same day — therefore under the same astrological configurations — in Russia as, in Western Europe and America. In 1900 there was a difference of thirteen days between the two calendars. Another controversial issue arises when we seek to erect an astrological chart for the beginning of the twentieth century, or any century except the first. Because the first century, according to historians, was made to begin with the year 1 A.D. which followed the year 1 B.C. it seems logical to many people to begin the twentieth century with the year 1900. Yet this reasoning ignores two essential facts. First, there never has been a year 1 BC. for the simple reason that the beginning of the Christian era was set retroactively a long time after its assumed beginning. No one ever witnessed a year 5 or a year 30 A.D. Second, what counts most when we deal with a century is when the collective mind of the people using the calendar is made aware of a change in the digit marking the hundred-year cycle: when 18 is replaced by 19. The archetypal impact of number 19 began to operate when everybody began to write and to see printed 1900. 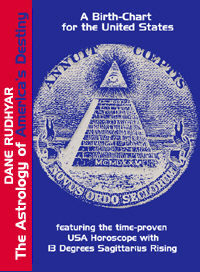 For these reasons, if we want to erect a "birth chart" for the twentieth century in Western Europe and America — and all countries using the Gregorian calendar — that chart has to be cast for midnight of January 1, 1900 For countries officially using the Greek Orthodox-Russian calendar, the century began on January 13. It began on still another date for the Chinese. For the Jewish people a rather ambiguous situation prevailed, inasmuch as Orthodox Jews at that time still celebrated the Jewish New Year, yet their everyday lives were conditioned by the calendars of the countries in which they resided — a matter of some symbolic importance.